K-laser is a treatment that can be used alone or in conjunction with chiropractic adjustments and acupuncture for better patient outcomes. K-laser treatments is an FDA approved therapeutic tool that addresses inflammation and discomfort in patients. So, if you are healing from a sports injury or are trying to address health concerns from an old car accident, k-laser may perfectly complement chiropractic and acupuncture treatments. Major Chiropractic of Wheaton specializes in chiropractic care and acupuncture to address sports injury and prevention, car accident related injuries, and insomnia. Follow along with us in today’s post as we explore the benefits of k-laser treatments. What health issues can k-laser address? While every person responds differently, acute conditions can often be treated in four to six sessions. Those with more chronic conditions, it may take longer, an upwards of six to twelve k-laser treatments. How often can you get k-laser treatments? If you have an acute condition, you can treat it daily if need be, until relief is experienced. Chronic conditions have seen the best results when treated two to three times per week and then tapering down to once a week until the pain and inflammation are more manageable. How long will it take to experience relief? Many times patients feel relief after the first session, while for others it takes a few more. One of the greatest benefits of k-laser is that its effects are cumulative — it continues to heal soft tissues treatment after treatment. What does k-laser feel like? 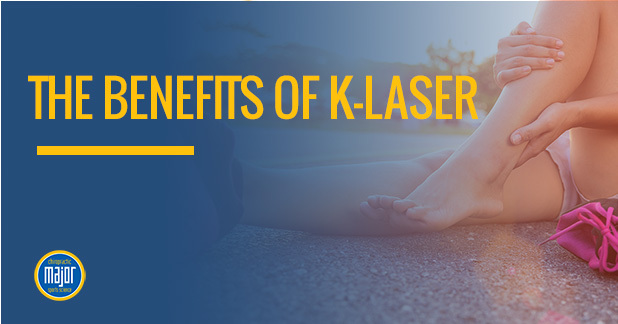 K-laser doesn’t really feel like much — there may be a little sensation or warm feeling, but overall it is just as if you were to put a light over an area. You will benefit more after the treatment than during it. How long is a k-laser treatment? A k-laser treatment can last anywhere from four to eight minutes, so it is a perfect addition to a chiropractic adjustment or acupuncture appointment because it is so quick. K-lasers has been used very successfully over the last couple of decades with very little side effects reported. Patients have reported that old injuries feel sore a few days following, but that is really the extent. K-laser is a safe healing modality to address many physical health issues. Use k-laser alone or with other modalities such as chiropractic care or acupuncture to increase healing time and improve your quality of life. If you’ve been dealing with an injury that just won’t quite heal, connect with Major Chiropractic to discuss a treatment plan.